The Sales and Marketing Director collected the accolade in front of about 100 members and industry colleagues at the annual BMTA gala dinner, held in association with Boating Business, in Canary Wharf at The Pearson Room on Wednesday, 10 January following the first day of the London Boat Show. Chris joined the Verwood-based diesel generator specialists in July 2014 as the Marine Sales and Marketing Manager and now oversees all sales and marketing activity at Fischer Panda UK, mainly focusing on the company’s core marine market. He was singled out for the award following his efforts to continue to develop and grow the business during a very successful 2017. In 2017, leading distributer Fischer Panda UK expanded its sales team, launched new generator models and enhanced its range of watermakers. The company also added the Bellmarine brand to its portfolio of electric drive systems and was also named as a distributor for digital switching specialist CZone. Fischer Panda UK was this year among the first companies to achieve ISO 9001:2015 certification, an internationally-recognised standard for quality management systems. 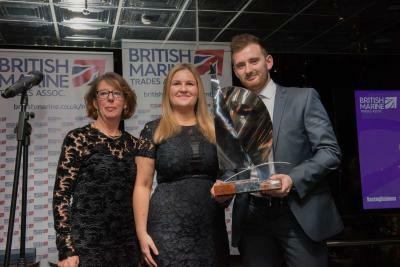 At the 2018 BMTA Awards, British Marine group associations, British Marine Trades Association and British Marine Leisure Boating had a combined five awards on offer, with industry publication Boating Business issuing another five on the night. The British Marine Trades Association Awards and Dinner was sponsored by Boating Business, PSP Marine, C-Quip, Marine Resources, A-Plan, Ocean Safety, Aquafax and Boatshed.